Database marketing is all about collecting customer data and how to use it as effectively as possible in your communication. The more you know about your (potential) customers, the more specifically the marketing campaigns can be organised. Consider, for example, segmentation based on demography, behaviour (e-mail opens and clicks, active / not active etc.) or additional data such as product preference and interests. All of this data can be used to deploy targeted messages, resulting in higher involvement, more activity and ultimately a higher conversion rate. - Decide in advance which data you want to use and leave out other fields. - Make sure your database is well-filled. It makes little sense if you know the age of only 20% of your database, for example. - Pay attention to the quality and uniformity of the data. - Regularly update your data. The database marketing trend continues in (advanced) targeted marketing. Because in addition to your own database, there are even more opportunities to reach specific target groups such as display advertising and search engine advertising. Through tools like Google AdWords, Bing Advertising, LinkedIn Ads etc. you can show your message to an audience that could be of interest to you. For example, it is possible to target demographics, language, location, keywords or websites based on topics. SEA uses search engines such as Google and Bing. These search engines give you the opportunity to rank above the organic search results with your paid ads. The advertisements consist of a header, sub heading, description and URL and you can enter the keywords you want to be found on yourself. How often your ad will actually be displayed depends on the bid you specify and the Quality Score, the latter is used to avoid entering keywords that do not match the ad and / or landing page of the ad. Display advertising focuses on advertising with visual advertisements, often called banners. These come in many different shapes and sizes and the channels on which you can use them are numerous. You can use the network of search engines like Google, but you can also advertise on (trade) websites. 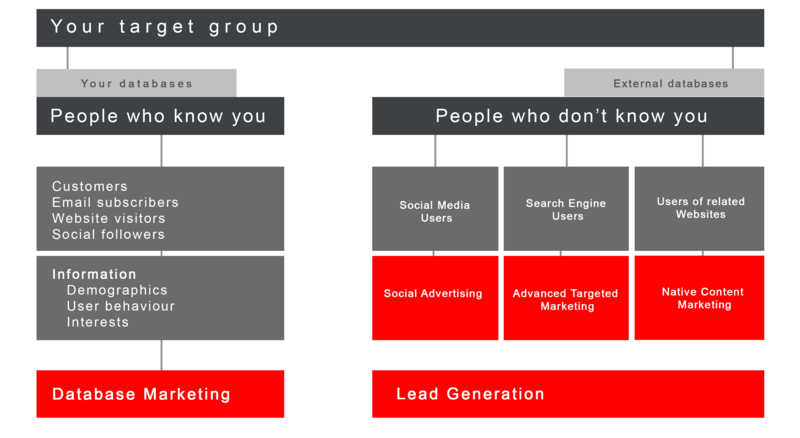 Which channel you choose depends on your message and target group. An interesting development within this trend is the use of remarketing, where you approach groups of users who have visited a website before and of whom you already know certain things about. This makes it possible to tailor your message even more specifically to the wishes and interests of your target group. Reaching the largest global audience in the field of geomatics, hydrography and industrial technology, we collect data on a constant basis through our brands. Using advanced tools, we keep track of our users and gather information about their behaviour, interests, demography and much more. This information is used to create better content, customer experience and targeted advertisements for our clients. Find out how we use database marketing for our clients. As the name suggests, in social advertising you use the advertising possibilities of social media such as Facebook, Twitter and LinkedIn. Because in addition to building a network with your own page, these platforms are also very suitable to reach a larger audience through paid advertisements. The advertising options of these channels have therefore expanded considerably in recent years. It is now possible to use remarketing via Facebook and LinkedIn offers the option to send sponsored private messages, the Sponsored InMails. Also in targeting ads you can choose from extensive options. In addition to demographics, interests etc., it is also possible to upload your own lists on Facebook and LinkedIn offers the possibility to target existing groups, even if you are not the manager yourself! With the rise of adblockers, native content marketing, also called native advertising or sponsored content, is becoming an increasingly popular form of advertising. This circumvents the adblocker because the message is integrated in the style of unpaid content and is therefore often perceived as less annoying by visitors. Examples include promoted posts, advertorials and infeed advertising. With this form of advertising, it is important to think carefully about transparency; is it necessary to mention that it is a paid advertisement? If you choose not to do this, it can have a negative effect on both the advertiser and the publisher, especially when relevance to the reader is not big enough. Find out how we use Sponsored Content for our clients. - Show a pop-up to stimulate signing up for a newsletter. - The possibility to request a quote. - A 'call button' on mobile websites. - Fill in an email address. Generating leads does not make much sense when nothing happens with it, this is the moment lead management comes into the picture. Often this is also the moment that marketing and sales merge, seamlessly or not, and the leads have to be converted into customers. This can be done manually, but there is also a lot of online software available for setting funnels with automatic messages matching the leads.